Touch is everywhere now, from the front of your phone to the screens of all-in-one desktops, and the mouse is no exception. With the release of Logitech's M600 Touch Mouse, the idea of putting a touch surface on a mouse is officially old hat—we've seen this trick done several times, at varying degrees of proficiency. The touch mouse to beat is currently the Editors' Choice Microsoft Touch Mouse. We got to spend some time using the new Logitech mouse, and while we'll reserve our ratings for a full review, it's hard to deny that the M600 Touch Mouse is one of the better touch-enabled mice we've used. 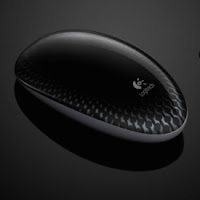 The Logitech M600 Touch Mouse is a wireless optical mouse, and it connects wirelessly through a USB nano-receiver, small enough to plug in and leave it for daily use. Plus, thanks to Logitech's Unifying Receiver technology, you can connect up to five additional wireless Logitech products through this one receiver, leaving the rest of your ports free. The shape of the mouse allows it to be used with either right or left hands, with the necessary adjustments available in the accompanying SetPoint software utility. The touch functionality is reasonably straightforward. You can right and left click, as with any normal mouse, and the mouse clicks with buttons, so there's no need to relearn how to do a basic click. Scrolling up and down is also simple, done just as you would with a physical scroll wheel, but by sliding your finger tip across the surface of the mouse. Plus, because you're using a smooth touch surface instead of a wheel, you can scroll horizontally as well. In our brief time with the mouse, the only function that gave us any difficulty was the horizontal scrolling. When scrolling through a collection of photos, it worked just fine, flipping from one image to the next with each swipe of a finger. When browsing the Web, on the other hand, it lets you jump forward and back, and navigate through Web pages without having to use the forward and back buttons in your browser. Getting it set up is easy: Put in the batteries and plug in the small USB wireless adapter. The drivers load quickly, and you're good to go. Logitech's SetPoint utility can also be downloaded to provide fine-tuned control over the settings and features of the mouse. Selling for a suggested retail price of $69.99, the Logitech M600 is similar in price to the Apple Magic Mouse, but costs more than most other competitors, like the Microsoft Explorer Touch Mouse or the Verbatim Wireless Optical Touch Mouse. Logitech also covers the M600 Touch Mouse with a 3-year limited warranty on the hardware. The M600 Touch Mouse is available for pre-order through Logitech's Web site, and will be shipping later this month.